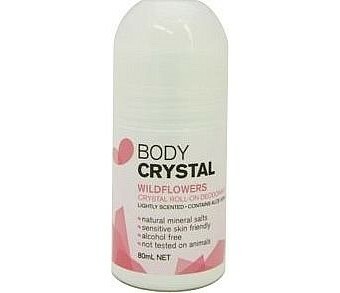 Body Crystal Roll-on Deodorant Wildflowers is an alcohol and fragrance free deodorant that contains natural mineral salts that smells great and prevents body odour. It's suitable for sensitive skin and glides on with an invisible layer of protection on the surface of the skin which kills bacteria. Contains no Aluminum chlorohydrate and no parabens. Ingredients: Water, Natural Potassium Alum, Aloe Vera Extract (Aloe Barbadensis), Hydroxyethylcellulose (Cellulose Derived), Natural Benzoic Acid (plant derived), Perfume, PEG-40 Hydrogenated Castor Oil.